Bobby Calvan of the Asian American Journalists Association’s MediaWatch program released the following report on Monday. Last Friday, a team of AAJA leaders met with high-level managers at KTVU for a lengthy discussion over the broadcast of bogus Asian-sounding names that purported to identify the four pilots on board Asiana Flight 214, which crashed at San Francisco International Airport on July 6. The 90-minute meeting, held at the station’s offices in Oakland, was professional and constructive. Representing KTVU: Vice President and General Manager Tom Raponi; News Director Lee Rosenthal; Director of Community Affairs and Public Service Rosy Chu; and Staff Reporter Amber Lee. AAJA’s delegation included Executive Director Kathy Chow, Governing Board members Ellen Lee and Tomoko Hosaka, and George Kiriyama, the immediate past vice president for broadcast. 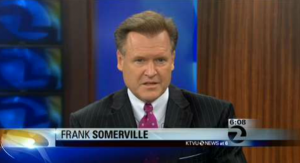 KTVU news anchor Frank Somerville delivered an apology on behalf of the station on July 12. AAJA’s primary interests focused on moving forward and understanding the chain of events that led to the on-air slurs being broadcast during KTVU’s noon newscast on July 12. We were firm in our questions, but professional. In the end, the station declined to share key details because of personnel issues and the continuing possibility of litigation. We expressed serious concerns over the lack of detail, and we will continue to push KTVU to be more forthcoming. Raponi suggested a quarterly meeting between AAJA and newsroom leaders to discuss ongoing coverage and diversity issues. We will set up the first session soon, with our San Francisco Bay Area Chapter taking the lead. Raponi also welcomed AAJA’s assistance in developing training, perhaps through a workshop or seminar, for KTVU’s newsroom. We will work with the station to help develop and conduct the necessary program. KTVU offered the S.F. Chapter use of its studios, logistical support and live streaming services to hold media access workshops, and Raponi said he would be pleased to participate. KTVU said it would work with AAJA to develop a pipeline of talented journalists who could add to the station’s diversity. KTVU offered to air public service announcements on our behalf if we are interested. The station would provide airtime on Rosy Chu’s weekly show “Bay Area People” to discuss diversity issues. AAJA invited Raponi and Rosenthal to attend our National Convention next month and to participate on the MediaWatch panel. We’re awaiting a reply. Where did the names come from? KTVU said it was still retracing its steps and declined to share specifics as to where it got the names. It said it is still talking with staffers to determine how the error occurred. We hope this process will be completed soon, and we will continue to press for details. In what form did the names come into the newsroom – email, telephone call, social media, Internet, fax? KTVU declined to provide details. How many people saw these names before going on air? Multiple people saw the names, according to the station, but did not provide a number. But the station said people from diverse backgrounds saw the names. The station has previously said that no one sounded out the names before being read on air. How much time did the station spend on the names before the noon newscast? Station officials did not give a specific time frame, but said they did not spend hours on it. Newsroom staffers have since been directed to get the name and title of any person confirming information. Were the names on a full-page graphic as a placeholder? These names were not used as placeholders, stations officials said. Did anyone realize the actual names of the pilots had been released a few days before? KTVU had previously reported the real names of two of the four pilots on board Flight 214. KTVU described what happened here as a total breakdown of the process. KTVU said there was no malicious intent behind the broadcast of the bogus names. There was no premeditation, Raponi asserted, calling it one of the lowest points of his career and that he was “disgraced by what happened.” Raponi and Rosenthal were apologetic and embarrassed, and grateful that we had taken the time to meet with them. Raponi said the station is doing its best to remove videos from YouTube. He also asked AAJA to discourage other journalists from repeating the names and perpetuating racial stereotypes. The incident has rocked KTVU’s newsroom, Raponi said. It was a clear “breakdown” in journalistic standards and integrity, he said, adding that “we shouldn’t have gone to air” with the names. In particular, Raponi questions whether the names, legitimate or not, should have been broadcast at all. What value were the names to viewers? Perhaps that question could have been considered more thoughtfully, Raponi conceded, if they had slowed down a bit. The station said it would do whatever it could to repair its credibility and relationship with the Bay Area’s Asian American communities. Raponi said he has reached out to a few Asian American groups. We appreciate the station’s top managers to meet with us and provide an opportunity to move forward. With interest in the incident still high, we look forward to having station representatives accept our invitation to join us at our convention in New York City.